Lake Mead is America's largest man-made reservoir. It is named for Dr. Elwood Mead, U.S. Reclamation Commissioner between 1924 and 1936. Lake Mead National Recreation Area was established October 8, 1964. Lake Mead backs up 110 miles behind Hoover Dam which was completed in 1935, thus creating this huge reservoir. Construction of Hoover Dam began in 1931, and the last concrete was poured in 1935 , two years ahead of schedule. President Franklin D. Roosevelt dedicated the dam on September 30,1935. The power plant structures were completed in 1936, and the first generator began commercial operation in October of that year. The 17th and final generator went into commercial operation in 1961. Hoover Dam was without precedent, the greatest dam constructed in its day. An arch-gravity structure rising 726 feet above bedrock, Hoover is still the Western Hemisphere's highest concrete dam. It is 660 feet thick at its base, 45 feet thick at its crest, and stretches 1,244 feet across the Black Canyon. There are 4.4 million cubic yards of concrete in the dam, power plant and related structures. Hoover Dam pioneered the Bureau of Reclamation's efforts in multiple-purpose water resources development. The dam controls floods while it stores water for irrigation, municipal, and industrial uses. The dam also provides hydroelectric power generation, recreation and fish and wildlife habitat. Lake Mead can store nearly 2 years of average Colorado River flow, about 28.5 million acre-feet of water. (An acre-foot of water is 325,851 gallons, or enough to cover an acre to a depth of one foot.) This water is released in a regulated, year-round flow as needed. 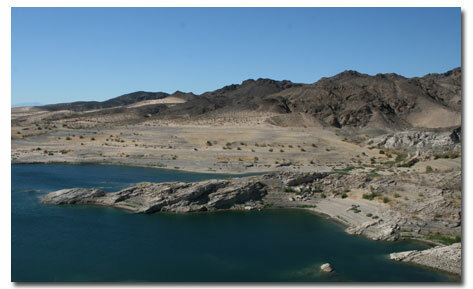 Three of America's four desert ecosystems -- the Mojave, the Great Basin and the Sonoran Deserts -- meet in Lake Mead NRA. As a result, this seemingly barren environment contains a surprising variety of plants and animals, some of which may be found nowhere else in the world. 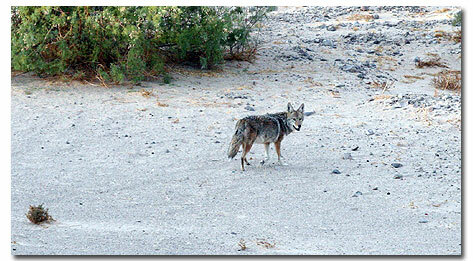 Lake Mead NRA is home to bighorn sheep, mule deer, coyotes, kit foxes, bobcats, ringtail cats, numerous lizards and snakes and a wealth of bird species. Threatened and endangered species such as the desert tortoise and peregrine falcon are found here, as well as ancient Colorado River fish species. Coyote on the beach, looking for something to eat. A long geological history can be seen from the 1.8-billion-year-old gneiss of Black Canyon to the lava flows capping Fortification Hill formed about 6 million years ago during the last Ice Age. The Colorado River covers a lot of ground on its way to the sea. There are many great areas to visit to get a view of the river and the landscape that it has created. Add human interaction to control the river through a series of dams, and you have some spectacular recreational areas and resources never before known in the desert. 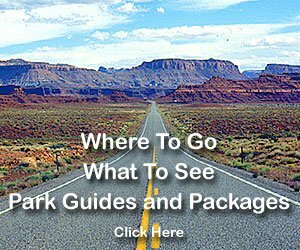 You can also explore the Colorado River and its many points of interest on your computer by clicking on the links below. In the summer, Katherine's Landing at the southern end of Lake Mohave is a hub of activity. It has fuel, a general store, a restaurant and a snack bar. The Colorado River south of the dam offers many recreational opportunities. Take a look at this river destination! In October of 2009, DesertUSA rented a houseboat to explore the western part of Lake Mead. Our first stop was the Hoover Dam off the Boulder Basin. Without Hoover Dam, Lake Mead wouldn't exist today. 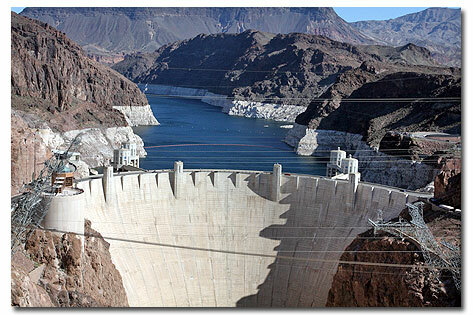 Come along with DesertUSA staff as they explore Lake Mead and check out Hoover Dam. Take a look at the cove where we camped, and the Bighorn Sheep encounter we had there! The completion of the Glen Canyon Dam in 1963 created Lake Powell. It took another 14 years to fill the lake. With almost 2,000 miles of shoreline, and five marinas, Lake Powell has become a major attraction for millions of visitors from all over the world. Take a look at Lake Powell and enjoy this desert combination of red sandstone formations, water and clear blue skies.